Sha Warvo might be one of the most frustrating shrines in Zelda Breath of the Wild, if not done properly. The challenge it presents is called Path of Hidden Winds, and it requires you to use wind columns to glide to the treasures. 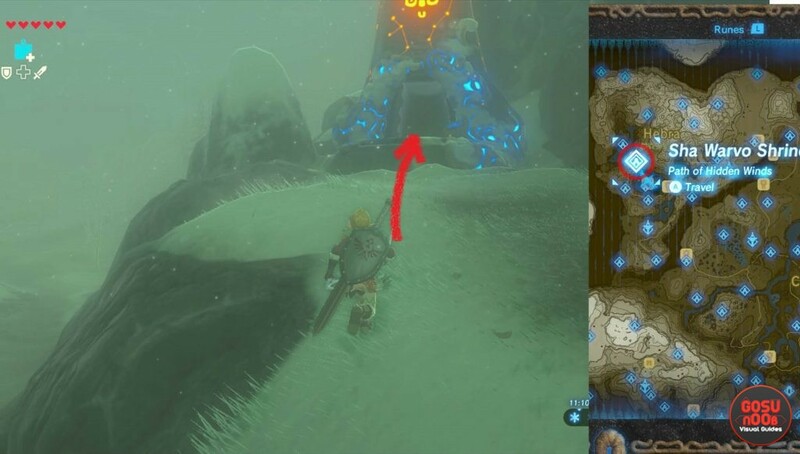 In this guide, we’re going to show you how to finish Path of the Hidden Winds challenge and get the spirit orb in Zelda BoTW Sha Warvo shrine. Sha Warvo is found in the northwestern part of Hyrule, in the area called Hebra Mountains. If you follow the main road, it will take you to Lake Totori and Rito Village. This is where you can buy the Snowquill armor set. This set increases cold resistance when worn. This is crucial in order to enter the shrine, as well as other mini-dungeons in this area. With the cold resistance gear or food, head northwest from Rito Village toward Dronoc’s Pass. The shrine entrance is there, near the crossroad, on the way to the Flight Range. To reach the spirit orb and two treasure chests, we need to use the five vertical air columns. The first two will take you to the first treasure chest, the one guarded by a small guardian (13 health). This is where you can learn about the air strike. As you glide above it, perform an air attack. Be careful not to do it before you’re directly above the platform and the guardian itself. You can fall down into the abyss, which will return you to the entrance. There is a purple rupee inside the treasure chest on this platform (worth 50 rupees). Look into the distance from the first treasure chest platform. You should spot another platform, with the third wind column. Glide toward it and use it to get to the ladder in the distance. If you are not sure whether you can land on them, aim for the moving platform at the bottom. Once you’ve climbed up the long stairs, look up. You’ll spot the spirit orb in front of this platform. There is a large and tall structure, a pillar, between the platform you’re standing on and the one with the spirit orb. There’s another wind column there. You won’t be able to see it from the ladder platform, you’ll have to glide around the pillar to find it. Before you use the fifth and last vertical air column to reach the spirit orb, aim for the tiny treasure chest platform in the distance. Due to its small size, it might be a bit tricky to land on. This treasure chest contains a Knight’s Bow (26 damage). Get back to the ladder platform, reach the fifth air thrust and head to the spirit orb to complete the Sha Warvo shrine.